This image shows the first of eight scheduled launches by SpaceX for Iridium Communications. The second Iridium communications satellite launch is scheduled for June 25, and will send 10 satellites into orbit. Elon Musk's private spaceflight company SpaceX is poised to launched 10 communications satellites into low-Earth orbit today (June 25), and you can watch it live here on Space.com. A SpaceX Falcon 9 rocket carrying the 10 satellites for Iridium Communications is scheduled to liftoff from Vandenberg Air Force Base in California at 1:25 p.m. PDT (4:25 p.m. EDT/2025 GMT). The live webcast is expected to begin about 1 hour before the opening of the launch window, and you can watch it on SpaceX's website, or here at Space.com. This is the second of eight planned Iridium launches with SpaceX. The launches will deliver a total of 75 satellites into space for the $3 billion Iridium NEXT global communications network. "Iridium NEXT will replace the company’s existing global constellation in one of the largest technology upgrades ever completed in space," according to a statement from Iridium. "It represents the evolution of critical communications infrastructure that governments and organizations worldwide rely upon to drive business, enable connectivity, empower disaster relief efforts and more." 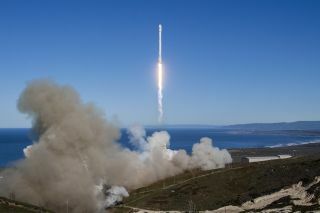 On Friday (June 22) SpaceX launched the first-ever Bulgarian communications satellite into orbit, after about a week of delays. That satellite launched aboard a Falcon 9 rocket that utilized a spent first stage booster. It was the second time that SpaceX has launched a commercial payload on a used booster. The booster being used in today's launch is expected to land on a droneship called the "Just Read the Instructions" that will be stationed in the Pacific Ocean. A backup launch window opens at 1:19 p.m. PDT (4:19 EDT/20:19 UTC) on Monday, June 26.